Namib-Naukluft is a huge reserve, 19,215 square miles (49,768 km2)—about the size of Switzerland—with the world’s oldest desert, tallest sand dunes, and some of the strangest organisms in the world adapted to live here. An engaging little golden mole has neither ears nor eye sockets—doesn’t need them, spending most of its life underground, where it’s cooler. Translucent geckos have lobed feet that enable them to dance quickly over the burning sand, and long dual-purpose tongues which they use to clean sand sprinkles off their eyes and drink moisture beads that accumulate on them from dawn mists. The stunted “living fossil” Welwitschia mirabilis, among the oldest plants in the world, sends its tap roots down more than 60 feet (20 m), and closes its leaf pores during blistering days. It can live more than 2,000 years, during which it grows only two leaves (they begin to look worn toward the end, their tough, leathery fibers nibbled occasionally by desperate grazers). Larger animals have learned to survive here too (as they have in the Skeleton Coast to the north)—mountain zebras, springboks, ostriches, gemsbok (whose notable drought accommodations enable them to adjust their blood pressure and perspiration), and their predators, including cheetahs and leopards. Sand dunes may reach a height of almost 1,000 feet (300 m) and, with varied sunlight and wind direction, assume spectacular shapes and multiple hues, apricot-gold, red and deep maroon, dramatically beautiful in the profiling light of sunrise and sunset. Dolomite mountains to the east rise in dramatic rock formations to 6,500 feet (2,000 m) and offer suitable habitat for agile klipspringers, black eagles, and Cape eagle-owls, among others. There are hiking trails (some quite arduous). Sandwich Harbor on the western coast is notable for birds, especially September–March when over a half-million birds can be present, including breeding flamingos, pelicans, and various seabirds. Access to some areas is by permit, on limited schedule, via 4WD vehicles. Accommodations include several comfortable hotels and lodges, as well as campsites (some with limited facilities). Any time of year is interesting, but winter nights can be cold. South of the park is a restricted diamond area where quantities of precious stones have been recovered from sand and gravel. It’s important also as a reserve for gemsbok, springbok, and others. 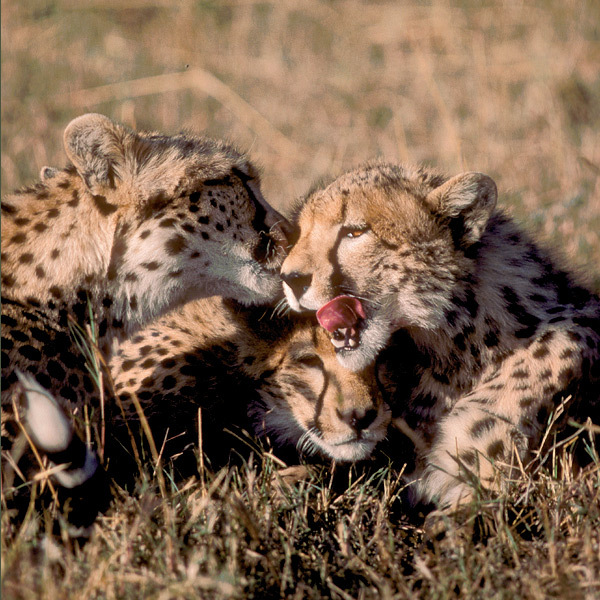 Cheetah cubs stay with mothers 15 months or so, grooming, purring (cheetahs don’t roar), and learning how to hunt. Fastest of all animals, they are capable of running up to 70 miles an hour (120 kph) in bounds of 25 feet (7.6 m)—but only for 600 yards (550 m) tops. Then the gazelle gets away.